Lizette and Eddie are getting married! We have arranged a special group discount for our guests through Heather Allison that includes; your airfare, accommodations, all meals and drinks, and transfers from and to the Cancun airport. She will also make sure you are on the group list that will be sent to the resort 2 weeks prior to travel with a note that you are part of the wedding group. Experience the Hideaway - The Hideaway at Royalton Riviera Cancun is a unique boutique, adults-only resort within a resort. This tranquil property caters to guests over 18 years of age only. It features everything necessary to create a relaxing and private moment to enjoy the comfort of a kids-free haven including an exclusive à la carte restaurant and a bar, and our crystal clear, adults' only pool. 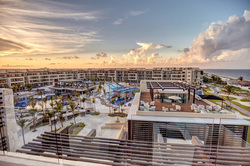 Hideaway guests may enjoy access to all of Royalton Riviera Cancun's restaurants, bars, activities, and health and wellness facilities. If you use Hotmail, MSN, Outlook, or GMail sometimes my emails end up in the bulk/junk/promotions folder. If you haven't seen a response from me within 24 hours, please check there. If you are more comfortable booking on your own, you can also book yourself through this link and you will be included in the group.